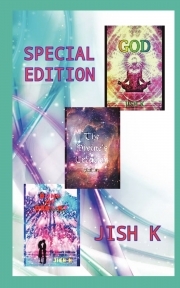 Description of "Special Edition - The Divine's Creation & Bond of Destiny & God"
Jish K (pen name) is an Ayurveda student and the author of ‘The Divine's Creation Series' and Broken. She loves to read and have read hundreds of Books. Her love for reading inspired her to write her own books. As a writer, she has written books in genre - spirituality, fantasy, sci-fi and romance. Reviews of "Special Edition - The Divine's Creation & Bond of Destiny & God"